The Mid-South Little Britches Rodeo Association (MSLBRA) is a sanctioned chapter of the National Little Britches Rodeo Association, the oldest youth rodeo association in the country. The Mid-South Little Britches Rodeo Association is devoted to the promotion of junior rodeo and continued support and encouragement of youth. The NLBRA season begins on August 1st of each year and ends with the National Finals in July. To qualify for the National Finals, a contestant must place in the top seven (7) of an event at five (5) individual rodeos. 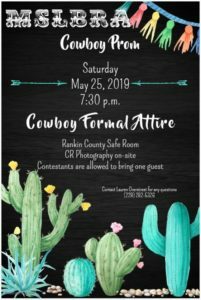 Each contestant takes their top five (5) places for each event to the National Finals at which contestants compete for buckles, saddles, scholarships and other awards. 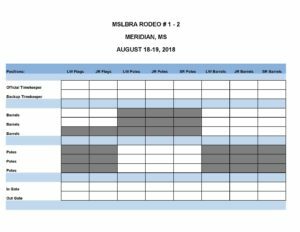 During the MSLBRA rodeos, contestants will compete for NLBRA points and their share of the Jackpot. The jackpot calculation will follow format C .
If you are interested in becoming a member of the National Little Britches Rodeo Association, print the membership form and send a copy of your child’s birth certificate to the national office. Each contestant is required to participate in at least 15 MSLBRA rodeos to qualify for year-end awards! A rookie is a contestant competing in the first year in that age group. If you are a rookie contestant in your age group, notify the secretary of your rookie status. 3. If a tie still exists after rules #1 and #2, the contestant who had the highest number of points coming in to the last rodeo will receive the higher place. If you need to draw out of a rodeo, a doctor or vet excuse is required to be given to the secretary BEFORE the stock draw on Friday night of the rodeo weekend. If you become sick on Saturday or Sunday, you must give a doctor excuse to the secretary before the rodeo weekend ends. Effective 8/1/2018, all jackpot payout CHECKS will be mailed to the contestant the week after each scheduled rodeo. No cash prizes will be given to contestants during a rodeo. We will use the address you provided on your NLBRA membership, so if that information changes, you need to notify the secretary ASAP! IF YOU MISS THE POSTMARK DEADLINE, YOU MUST CALL THE SECRETARY TO SEE IF ENTRIES ARE STILL BEING TAKEN. No entries will be taken after TUESDAY of the rodeo week. No exceptions! Don’t forget there is a $5 charge at the gate – please do not send your gate fee with your entry form. If you miss the postmark deadline, you must call the secretary to see if entries are still being taken. STALL AND RV RESERVATIONS ARE ALWAYS DUE ON THE POSTMARK DEADLINE FOR THAT RODEO! Make your reservations by texting Dianna at 228-860-4955 between the hours of 6 am and 6 pm on the postmark deadline. Early reservations will not be accepted. All stall and RV reservations must be paid by 3:00 p.m. on Saturday rodeo. If payment is late, there will be a late fee of $25 and the contestant will not earn state points. Additional shavings can be purchased for $7/bag. If you reserve a stall or RV, you are responsible for paying even if you do not utilize it. Overflow stalls and RV: Contact the Scott County Coliseum for availability. 2. Registering online at www.nlbra.com. You must still mail your entry fees to the secretary by the postmark date. The new 2017-2018 Official Rule Book has been published – you can find it in the “Forms” section. Please be aware of the changes that will affect you! The stock draw is scheduled for 9 pm the night before the scheduled rodeo, or as soon as stock numbers are provided to the judge and secretary. MSLBRA MEMBERSHIPS! Deadline to apply for MSLBRA membership is Saturday, November 17, 2018. No new memberships will be accepted after November 17th. Sponsorship money is due by Saturday, November 17, 2018. The work schedule is now being filled for the first rodeo. Work requirements have not been completed, but all members must work. So, if you see a slot you want to work, please text Trevor at 601-416-1985. For vacant work slots, we will draw names to fill the positions. Timekeepers, gate workers, and flag race barrel workers will work both days. Barrel racing and pole bending workers will work Sunday only. Work requirements and schedule will be available at the secretary desk. A $250 fine for failure to work designated events. Also, contestants will not be able to enter another rodeo until the fine is paid. CONTESTANTS/PARENTS cannot arrive at the Rankin County Multi-Purpose Facility before 3:00 pm on Friday afternoon. Do not stop, park or unload your truck/trailer in the fire lane next to the stall barn in Brandon! The Sheriff Dept will be patrolling and issuing tickets. The new parking lot is open. For those that will park there and run generators, the early arrivals should park near the rear of the lot. This will allow easy parking for later arrivals closer to the entrance.